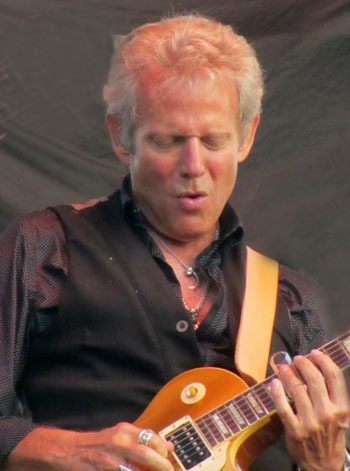 Don Felder the former Eagles guitarist, Grammy Award winner, Rock & Roll Hall of Fame inductee and best selling author returns with 'Road To Forever', his first solo album for 30 years. 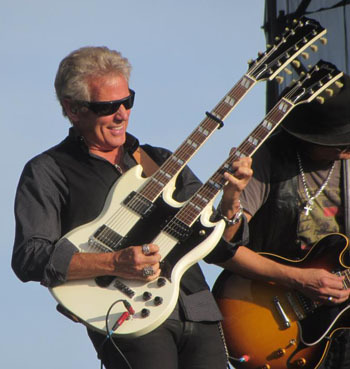 Don's signature guitar sound was an integral part of The Eagles for 27 years. 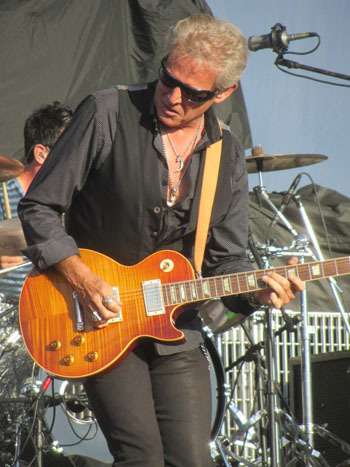 He helped cross the band over from country to LA rock, co-wrote 'Hotel California' & through his work with Joe Walsh, Bob Seger Stevie Nicks etc, became one of the most influential guitarists of the time. In 2008 he wrote the best selling book ''Hell: My Life in The Eagles 1974-2001' and now comes the equally cathartic 'Road To Forever' CD. It's an impressive album that parallels the book in terms of its autobiographical lyrics while restating his LA rock credentials. 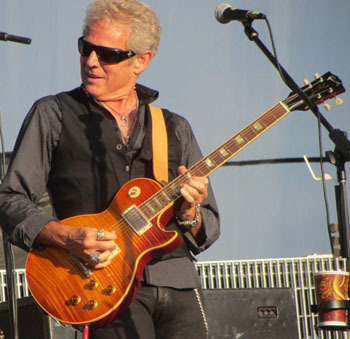 Don Felder talks to Pete Feenstra about the new album, his time with The Eagles and the song writing process. 'Road To Forever' contains all those things we associate with you from your signature guitar sound to rich harmony singing. Was it difficult to go back and find your own style outside of your long tenure in The Eagles? No not really because this album is totally different from what I used to do with The Eagles. When I was writing for the band it was a situation in which you are writing for a select group of people - a cast of characters with a particular style. So I would have to think about how Don Henley would sing for example, or keep the music fairly simple, think about Tim's dexterous bass playing, or Joe's particular guitar style etc. So I ended up writing in a particular way to suit their style. This album is much more of a liberating process for me and I'm writing about myself for the most part. Do you think you could have made an album like this without going through all the experiences in The Eagles? I think all the best writers and artists reference their true life experiences and all the memorable things that happen to them at some point. 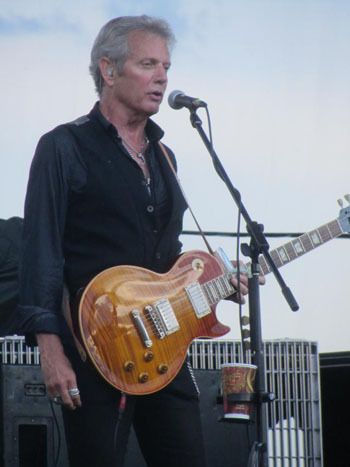 In 2001 I had a difficult divorce and within the same year I left The Eagles, so I lost part of my identity, from being a member and guitarist of a well known band to being a husband. The album is really about me finding myself again by going back through those experiences and working through them. I think all those experiences ultimately mould and shape us one way or another. Was the album a cathartic release for you, much like the book? Very much so. Over a 12 year period of cathartic research I went back to meditating and 'Heaven and Hell' gave me an insight into my life and all the experiences. When I was on the road with The Eagles I practiced yoga in the morning and used meditation to calm myself down. And while it was a difficult to do when you were in a Holiday Inn with a freeway right outside your door, it was still a good way to start the day. So I used these techniques and they proved to be very insightful. ...over the last eight or nine years especially, I really missed playing live and so I wanted to start writing songs that I could take out on the road and play. Hadn't you had enough of touring after The Eagles? At the time we were all exhausted. I guess Glen summed it up best when he said; 'we created a monster and it ate us up'. Initially we set our own pace, but Bernie Leadon left us as he felt the pace of work was going beyond the boundaries of his health � the sleep, touring, travel, studio, and writing cycle - and eventually he wanted to take 2 to 3 months off. It was his idea but when he suggested it to the band nobody else wanted to stop, as when you are a hot act you tend to want to keep going. I'd known Bernie since high school and I dearly love the man. He's brilliant musician and great song writer. But going back to the gigs, over the last eight or nine years especially, I really missed playing live and so I wanted to start writing songs that I could take out on the road and play. Did this album offer you a fresh start? That was the objective really. The songs on the album are really a search for the self. It's me trying to figure out what happened in my life and how I came to grow from an impoverished background in Gainesville Florida, to moving to New York and then eventually relocating to California and joining The Eagles. It's also about the way my mind changed and the journey from being brought up by my mum's morals and going to church, to the 70's era of drugs and promiscuity. It was all about how my life got to that point. I did a lot of meditation and worked through a lot of recollections. Do Crosby Stills & Nash sing harmonies on the opening track 'Fall From the Grace of Love'? Yes we've been friends for years. In fact I've known Steve Stills since he was 14, when we were in a high school band called The Continentals. When Steve left, Bernie Leadon replaced him in the band. Our paths have also crossed a lot since then and when I first went to the west coast I played Steve's part in the Crosby and Nash band. Also Graham's son Jackson was like a big brother to my son Cody at school. So 'Fall From the Grace of Love' was the kind of serendipitous song I wanted to open the album with. It's a great song and also the lead single from the album, but hasn't 'Girls in Black' got more potential? Well we identified 'Fall From the Grace of Love' as having triple AAA radio appeal while 'Girls in Black' is the second single and is more of a Classic Rock song and it's being played now. Did you have any kind of stockpile of songs to refer to when making the album? I had some ideas. I've had a home studio since about 1981 and over a period of time I moved from analogue and digital to ADAT and eventually Pro Tools. And while I've kept up with technology I continued to write and sketch new ideas. The new record really was a relief for me in being able to play, write and pursue these ideas in their embryonic form. My approach is much like the way I approached 'Hotel California' which started out as a thumbnail sketch. Generally I would have the idea, sort out the arrangement and the lyrics and then build the structure and then record. So I worked my way up to about 16 potential songs of which 12 were used and the other 4 will be offered for free on downloads via iTunes or my web site etc. How did producer Robin Di Maggio become involved? Originally I started working with with a top rock producer called Greg Ladanyi who had worked with Don Henley and lots of great bands. We started working on the record and leading into making the album we would have these planning meetings and discuss what we were going to do, who we thought should play on the record and how to order the 16 songs etc. Well Greg brought Robin in on one of those meetings. He's actually the nephew of the legendary baseball player Joe diMaggio. Once we had started, Greg went to Greece to see one of his artists and he sadly passed away. And after talking about it for more than a month Robin took over the co-production. The song 'Road To Forever' is actually my salute to Greg. We brought in everyone on the track who Greg had suggested should play on the album. Among Robin's credits he's worked with Paul Simon and the end of 'Heal Me' sounds like something Paul might have done himself? I liked a lot of Paul Simon's stuff and I tried to transfer that uplifting spirit of the music into the studio. The song is about the damage of growing up from childhood onwards. Life batters us all and ultimately we try and cleanse it all away. So the song is talking about how we reach a place in life where you can be healed. We originally had two songs and the end-piece was called 'Healed', with the idea being after the damage you can be healed. So we merged the two tracks together with the positive uplifting African feel at the end. 'Wash Away' is another highlight and a very subtle production, but it sounds like it came from a different project? It was another embryonic idea that I started with and I wanted it to be a very different arrangement from everything else on the record. It was a lullaby for our little boy when we were waiting for his arrival. I wanted it to be a diverse record because the record is about different parts of my life and that track is different. Tommy Shaw from Styx helped me write it and he sang harmonies on it. I was stuck on a couple of verses so we worked on them and when we finished I said he had to sing on the chorus with me. Given the autobiographical nature of the songs, didn't you already have the lyrics worked out? On 'Someday' I worked with Timothy Drury a brilliant keyboard player who spent about 3 years in Whitesnake. We sat down and wrote together. The compositional process would be that he'd do the keyboard part and then I might add a chorus and we'd end up with a piece of music. I'd add the melody, go to the song's concept, sing it on the chorus and then link it all together. Regarding song writing, do you come to a project with a rough demo and then add the band's input to the number? I work on the pre-production in my studio at home and start by adding a drum machine, then I'd play bass and guitar and then work on an arrangement that suits the piece. I'd do most of the vocals and finish the lyrics. So I would have a demo with most of the lyrics, vocals, harmonies, and guitar, before taking it into a studio to record with other musicians. The next stage would be replace the drum track and then I'd bring in say Chris Chaney on bass, Steve Lukather on guitar and David Paich's keyboards. I would then work on the vocals and do the backing vocals - or Timothy might sing - and so we'd move from the ideas and the structures to the finished product. I liken the process in terms of a New York artist I met between 1969 and 70. He had these huge canvasses that looked like a 17th century painting of women talking to men, with birds in the background. What was missing in the pictures was the hands. I later found that he had these pictures of hands at the bottom of the studio walls. So I said to him why are there no hands in the picture? He told me that the hands were most expressive part of the body, apart from the eyes. So his way of working was to try and get the right sort of emotion before adding them and I thought this was a brilliant way of approaching song composition and musical arrangements. So I adapted the same process for demos, where you'd eventually master oil over the top of them. Was the ballad 'I Believe' written with radio plays in mind? No, it was actually written for Michael Jackson and the Jackson 5. Id been working with Michael and Diana Ross in London. Michael loved slow romantic ballads and I had written this track but we had no lyrics at that point. Jermaine Jackson sang some oohs and aahs on the chorus and then the melodies and harmonies. But The Jackson 5 never got to record it and so I took the melody and concept and turned it into a guitar driven piece. 'You Don't Have Me' feels like a musical cousin of 'Life in the Fast Lane'? That song is basically a commentary on the kind of relationships that fall into two categories, the givers and the takers. And it's about a relationship when you are with a taker, a person who is never really satisfied and always wants more. You get to that point where you say I'm out of here, you don't have me. The title track seems to carry a spiritual input? There is a spiritual element there, but the song came to be about Greg. It also deals with my personal revelations, my life laid out. The book was about my time in the Eagles, and the album is a reflection on my life. It's the same with a band as it is with families. We did try and hold it together, but when huge sums of money become involved everything changes and you are not a band anymore. When The Eagles reformed, was there a genuine belief that it could work despite what happened before? Everyone in the band made a real conscious effort to be on our best behaviour and to try and make it work. But once the huge sums of money become involved everything started to slide. Did the commercial pressures change the music as well as the people in the band? Yes they did. Before I joined The Eagles I was in a very creative jazz fusion and rock band called Flow. It was very creative and everyone could improvise. What happened in The Eagles was that you ended up playing everything note for note. It was almost like being in a play and it all became very sterile. It got to the point that even at the sound checks no one would join in, they would just go there to do their your parts. It was the same in the studio, and when you don't have any spontaneity or creativity it all quickly withers on the vine. Did you ever hear the guitar solo on Jethro Tull's 'We Used To Know' which predates 'Hotel California' and is very similar? No I never heard that. I'm not really familiar with them apart from the fact the frontman plays flute. Going back to your early career, why did you hesitate to accept Bernie Leadon's offer to move to the West Coast? In the early days I already had connections in New York City before I moved there and later I moved to be with my fianc�e in Boston, and was trying to build my career. But after working 9-6, six days a week, trying to gain experience for not a lot of money and doing things like playing movie themes on a nylon string guitar in a Holiday Inn restaurant I was ready to move on. The nylon string guitar came in handy some years later when we did the acoustic version of 'Hotel California' on 'Hell Freezes Over'. Anyway, eventually I'd saved $1000 and got a U-Hail rental truck and headed to the west coast. You've said that passion for music is what keeps you going. Are you still passionate about music after all that has happened? Yes I still am. I always loved playing music right back to when I was 10 years old. I like all the other aspects of music such as writing and recording in the studio but most of all I like to play live. 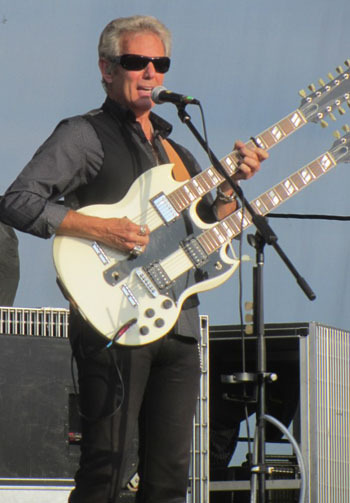 There was a creative vacuum when I was in The Eagles so this solo album is an opportunity for me to write my material, play it live and make a connection with the audience.